Hostgator is a world-famous web hosting provider with services ranging from shared hosting to cloud. They were established in 2002 and are based in Houston with an additional presence in Austin, Texas. Most of their servers reside in Provo, Utah and Houston, Texas with some residing in other locations. In the world of web hosting, there is a single name and company that comes up with far more frequency than almost any other – HostGator. 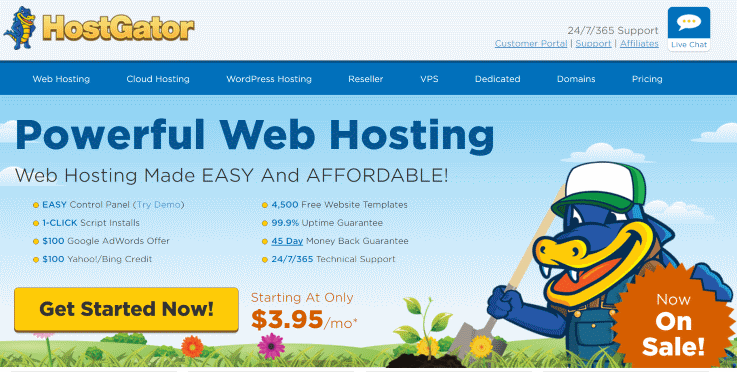 Hostgator is one of the best-known hosting companies in existence. Their history dates back to 2002. You can choose between shared hosting, WordPress hosting, VPS hosting, dedicated hosting, and reseller hosting. Is it the right choice for you, though? Read on to find out more. Note: A long history is not all you should look for. GreenGeeks is a newer company that in my book is just as equipped to host your most important websites. One of the real giants of the web hosting and web service industry, HostGator has for years been offering people the absolute top of the line hosting and domain service for web professionals, entrepreneurs, and individuals. Quick App Installer – You can choose from more than 75 applications and install them with just a few clicks. Powered by cPanel – The industry’s best-known control panel, cPanel brings all the goodies necessary to build and maintain an excellent website. High Standard Support – Non-stop server monitoring and live chat, phone, and email support. Pro gramming and Databases – PHP, MySQL, SSH access and more for the advanced users. They go the clean and minimal route with almost all of their design choices on HostGator.com, but this shouldn’t throw you off – they are masters of efficiency and have one of the best-run web hosting providers you could find anywhere in the world. I know I’m talking pretty glowingly about HostGator.com – but there is a genuine and significant reason. They are the top of the mountain (along with a couple of others) when it comes to web hosting and one of the best solutions you could end up investing your money with. Get started for as little as $4.86 per month. This pricing is slightly more expensive than many other web hosts out there, but it is still well within industry norms. HostGator provides a control panel which designed for ease-of-use, and which is ideal even for beginners. You get 4,500 free website templates to choose from, making it easy to create your site. Scripts are easy to install with a single click. You get $200 in free advertising credits just for signing up. Support is ready 24 hours a day, seven days a week. Created in a dorm room at the University of Florida in 2003, HostGator has gone on to establish itself as one of the industry giants. Boasting over 8 million domain registrations and well over 400,000 customers, once you give HostGator a try, you’ll soon understand why they’ve been able to land themselves on the Forbes list of the fastest growing organizations – tapping in at 21st place. Not too shabby for a relatively new web hosting company. Let’s take a look at the different types of hosting which HostGator offers, as well as each of the plans that you can choose from. The most basic hosting provided by HostGator is shared hosting. This inexpensive option allows you to cut back on costs by sharing server space with other customers. Dedicated hosting, on the other hand, is the most expensive hosting. With this type of hosting, you have a physical server all for yourself. This hosting is ideal for large commercial businesses, whereas shared hosting is suited to customers operating small personal websites and businesses online. A middle ground option offered by HostGator is VPS web hosting. VPS stands for “Virtual Private Server.” With a virtual private server, you are sharing the same physical hardware with other customers, but your server is running as a virtual private machine. It gives you the functionality that you would have with dedicated hosting at a fraction of the price. Additionally, HostGator offers reseller hosting, which is perfect if you run a web development agency to build sites for other customers. They also offer WordPress hosting for bloggers. Now let’s take a look at the different plan tiers available for each hosting. Hatchling Plan: Starting at $4.86 per month, going up to $10.95 per month after the promotional period ends. Baby Plan: Starting at $6.96 per month, renewing at $11.95 per month. Business Plan: Starting at $10.46 per month, renewing at $16.95 per month. At the lowest tier, you get only a single domain, but you do get unmetered bandwidth and a shared SSL certificate. If you opt for one of the top two tiers, you get unlimited domains. At the highest level, you add in a free private SSL certificate and IP address, as well as a free toll-free phone number. Each plan comes with all 4,500 free website templates, free website building tools including Weebly Site Builder, free website transfer if you need it, and transfer for scripts and MySQL. On top of that, they give you 52 free scripts you can apply effortlessly with a click of a mouse. The shared hosting plans also include $200 in complementary advertising credits. There are five different tiers of VPS hosting services available on HostGator. The lowest cost plan is the Snappy 500, which includes 0.5 CPU cores, 512 MB of RAM, 25 GB of disk space, 500 GB of bandwidth, and 2 IP addresses. This plan starts at just $11.97 per month and renews at $19.95 per month. Hostgator is less expensive than many competing plans offered by other web hosts and represents a great deal. The highest level is the Snappy 8000, which includes 4 CPU cores, 8 GB of RAM, 240 GB of disk space, 3 TB of bandwidth, and 2 IP addresses. This plan costs $99.97 per month to start and renews at $159.95 per month. What is great about HostGator’s VPS plans is the fact that you have five different tiers to choose from, whereas most other companies confine you to three choices. It means that VPS hosting is flexible for any budget, and there is a package of there which should be perfect for your needs. As with the shared hosting plans, these VPS plans renew at higher rates. If you use WordPress as your content management system and are looking for a web host who caters directly to your needs, there are a few great options out there, and HostGator is one of them. Not all companies offer WordPress hosting specifically; a lot of them just offer shared hosting and compatibility with WordPress. The difference here is that they optimize these services for WordPress. Starter: $5.97 per month during the promotional period. Standard: $9.57 per month during the promotional period. Business: $16.77 per month during the promotional period. As with the other types of hosting offered by HostGator, these rates increase when it comes time to renew your plan. All plans include unlimited e-mail and storage and automated daily backups. Backups are an excellent feature, as many web hosts will charge you extra for this. The upper tiers allow you to migrate more sites and also provides you with better performance for higher amounts of monthly site traffic. These plans include free advertising credits as well. The most expensive plans on HostGator are dedicated hosting plans which allow you to have a server all to yourself. You can choose from a Linux or Windows environment; either way, you’ll pay the same starting rate. It is remarkable since a lot of hosts will charge extra if you want to use a Windows environment. There are four tiers available starting with Basic for $105 per month, and ranging up to Pro at $225 per month. These are the plans that you want to choose if you’re running a large commercial website and need the maximum resources available to you at all times. and premium WordPress features designed to simplify your life. HostGator also has online shops in mind. The company recommends you to choose the Business plan to host an online store. This plan gives you a free dedicated IP address as well as a free dedicated SSL certificate. It is compatible with many different shopping carts and allows you to accept payments through various online gateways. When HostGator hosts your site, it is protected by a customized firewall. It protects your site against DDoS attacks. If you get WordPress hosting, you can take advantage of additional advanced security features which protect your WP installation from malware. Once you peel back the initial layer, it’s easy to see why they’ve been able to enjoy so much success. HostGator prides itself on having some of the best technology in the world for its servers and equipment – and even though they are constantly upgrading and pushing the envelope hardware wise. The uptimes and levels of reliability that they can produce are just astounding. Not offering just a single level of hosting, HostGator.com allows you to choose the plan (and the price point) that is perfect for your unique situation. They have incredible support teams that will walk you through the entire process, and I’ve even found them to be able to help when I was in way over my head. Live support is one of the most important things for a web hosting company to have (especially when every second your site is down or having a problem could mean lost sales), and HostGator pushes for the highest of standards with all of their techs and support members. That has been my experience. Sadly, not all customers are impressed. They seem to be disappointed. I have looked over numerous customer reviews and have seen many reports that HostGator is very slow to reply to e-mail queries or pick up the phone. They report that customer service agents are often unhelpful and slow to resolve issues. This is disheartening, though thankfully not universal. It is not necessarily enough on its own to stop me from recommending HostGator. It is a good reason to be cautious, however, which is why I suggest that you take the time to test drive not only the hosting service itself but the customer service as well. Even if you do not have any problems during the initial 45 days of service, take the time to call or e-mail the company with a question or two. Make sure that you are happy with the response before you commit to a package. Contrary to what many reviews report, I’ve had nothing but pleasant experiences with any of their frontline team members. Every time I had an impressive resolution to problems that I caused in the first place. HostGator backs all of its plans with a 45-day money back guarantee. This period is quite good, as the industry standard is 30 days. So HostGator is giving you a little extra time to make up your mind and commit to a package. It is one area where HostGator excels. All accounts come with free website building tools including Weebly SiteBuilder. As mentioned previously, there are numerous scripts available you can install and run with a single click. Additionally, if you are opting for WordPress hosting, you get to use a customized control panel which has been explicitly streamlined for blogging. So no matter what type of hosting you choose, and however much or little experience you have, you are in for a great experience. One great thing about HostGator is that it is pretty much good for everyone. HostGator offers such a wide range of plans and types of hosting that no matter your needs or your budget, you should find something to suit you. So whether you run a global commercial enterprise or small personal hobby site, HostGator has got you covered. There are many types of plans available, and more tiers than a lot of other companies offer, especially with VPS hosting. Options are flexible for all budgets and needs. HostGator specializes in WordPress hosting and offers a ton of excellent features at a very reasonable price point. If you are a beginner looking for ease-of-use, you’ll find it here. HostGator provides many simplified tools for website design and scripting. Features for e-commerce are also excellent, and HostGator gives you everything you need to run an online shop and accept a variety of payment methods. The 45-day money-back guarantee is above and beyond the 30-day standard for the industry. You will have more time to make up your mind before you commit, and should not feel rushed into making your decision. Some of HostGator’s plans are more expensive than plans offered by competitors. The lowest tier of shared hosting is a couple of dollars more per month than you will find with some of the other hosts. Thankfully, some of HostGator’s other plans are less expensive, like the lowest tier for VPS. The biggest con to mention with HostGator is the odd reports of customer service. There are just too many to write them off as flukes. The last thing you want to be dealing with when your website is down and losing money is a company that cannot be bothered to solve your problem right away. Again, I recommend that you test out the team yourself with a few questions before you commit past the initial 45-day period. All in all, HostGator seems like a web host with a lot to offer. Aside from the mixed reports about customer service, there is not a whole lot to complain about. So if you are interested in giving them a try, you can do so with a 45-day money back guarantee (this does not cover add-ons and free domains). Hostgator has a sound reputation, and they do appear to offer some excellent services and benefits. Our experience with them is steadily improving. It’s certainly a good choice, but I don’t see a definite edge over a competitor like Inmotion Hosting. If you are looking for reasonably priced shared or VPS hosting from a company with a lot of industry experience, Hostgator is an excellent choice. Their cloud service is nothing less than pure awesome. Their pricing is not the best and to improve that, I have asked for an exclusive deal for my visitors. Click on the button below to see the deal (while it lasts). Disclosure: I am an affiliate of Hostgator, and I get a commission when you click a link and purchase hosting. That’s how I maintain this website. It doesn’t cost you anything. In fact, I can guarantee you get the best price when you are using my links. We have secured a special coupon for our visitors: get 30% off on 1-12 month terms; 40% off for 24 months and 36 months. Use coupon code HOSTINGMANUAL. I have rated Hostgator 4 out of 5. Hostgator is in the top 5 of my reviewed web hosts. See more. Hostgator is a well-rounded service and incredibly popular. The cloud plan boasts of very high uptime, which makes it a solid choice.